Earn $2.48 in Rewards credit (248 points) What's This? Multipurpose tire for touring and daily use. 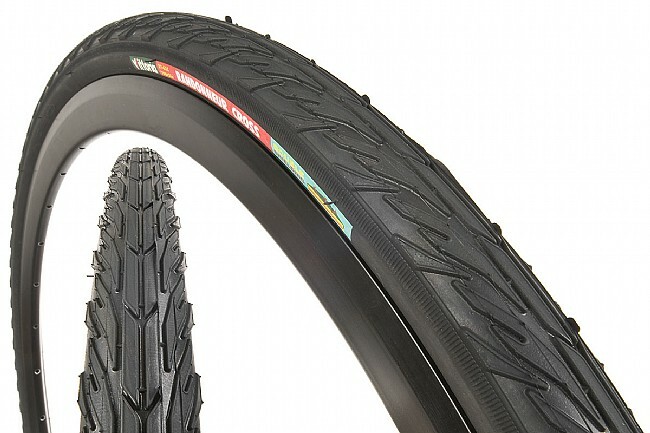 Its specially shaped tread makes Randonneur Cross a real multipurpose tire, at home on the road and off-road trails. Randonneur Cross features Aramid 3D Compound for optimal durability and grip. Double Shielding puncture protection. Sizes: 700c x 28mm (28-622 ISO; 510 grams), 700c x 32mm (32-622 ISO; 582 grams) or 700c x 35mm (37-622 ISO; 630 grams). 45-70 psi. Wire bead. Black. I live in Sonoma county & ride some of the worst roads around as well as lake Sonoma & lake Mendocino with my cross bike. I do not ride in any rainy or loose dirt conditions. It is all dry street. However, I do ride in very thorny, desert conditions. I still get flats with these tires and therein lies the problem. They are like murder to mount. I have the plastic tools to help me but they still cause me serious grief. I have expensive wheels that I would rather not have scared up but you can't help it trying to get these tires on. It made me scream out loud on several occasions. I am ditching this set for one that is hopefully easier to mount. I don't mind changing flats but not when its super, crazy hard like these are and mucking up my wheels in the process. Me + Bianchi Volpe + cameras/mounts + water = 250 pounds minimum, yet these tires remain fast with excellent road feel. Cornering tip-in is linear and predictable. Traction is good to excellent everywhere wet, dry, asphalt, concrete, gravel, dirt. Put 1,000 miles on a set last year with negligible wear and zero flats. I bought a set of these tires to replace the stock tires on my roadbike. I don't ride it as much as my mountain bike so I went with these because they were fairly cheap. I have put a quite a few miles on them and I ride in an area full of sandburs and after about two months, still no flats. The traction provided by the tires was great. After riding with stock tires, these tires will give you a huge boost in speed. The only issue that I had with the tires was getting one of them on the wheel. They fit really good once they are mounted though. As an urban commuter and cycle enthusiast this tire has stood up in most road environments including off-road dirtgravel as well as pavement. Very stable when cornering. Easily mounted round and true. Rolled well on wet and dry crushed limestone and paved roads. Great tires for a bigger rider! I used Continental Gatorskins in 700x25 for many years, and had 3-5 flats per year. The Gatorskins are very, very good tires, and are much lighter, and marginally faster than these... but since I switched to these tires, 700x32, about 2 or 3 years ago, I haven't had a single flat tire. Not one. These Vittoria Randonneur's are fatter, provide better comfort, more traction on sloppy wet surfaces, and they require less psi. To me, the important thing is that these tires have resisted every North Carolina pothole, glass shard, roofing tack, squirrel carcass bone and mystery-road-debris-chunk that I've hit since putting them on. I'm a MUCH heavier rider than most - around 240lbs now, down from 345lbs, some eight or nine years ago. I'd say clydesdale, but that might be insulting to the clydesdales. These tires don't have any sidewall give, and I hate flat tires... Walking around in Sidis might make nice shaped calves, but it's no fun. Considering everything - the cost, quality, comfort, longevity, and flatproofiness, I think these tires are not only the best tire out there - they are also a screaming bargain. I HIGHLY recommend them. This is my third set of Vittoria Randonneur Cross 700c Tires. They last about 5-6K miles, I've never had a flat or blowout. They are a little difficult to install, but are sturdy and smooth riding. I highly recommend these tires. Tire used in urban commuter setting successfully. Potholes, glass, rocks, etc. are not nearly as intimidating when using these tires. Not great for aggressive cornering. The tire feels like it is folding when pushed through turns quickly. Not sure if pressure, sidewall strength, or overall size is mostly to blame. These tires came stock on a bike and I've slowly put them two other bikes. These are the best tires I've every ridden. The set that came on my Raleigh Sojourn are still going strong without a single flat in over 5,000 miles. I had to rotate them after doing a tour. If you're riding loaded down your the rear has a tendency to wear faster - as expected. They're the best tire I've found for any bike that doesn't need a mtb tire. I've used these tires for 2 years. I have to replace the rear but the front is still going strong. These are very good all around tires. The 35's have nice volume and low rolling resistance. It seems much lower than the Randonneur Non-Cross which came on my bike. I would buy these again and recommend them. No Flats in 2 years over all kinds of terrain. 9 of 16 customers found this review helpful. Can't use these tires. Bought them for my son's bike. The beads are smaller in diameter than other 622's. Very difficult to mount at home using plastic tire pries. Normally I can remove and mount tires without any tools. Tried them on different rims and same result. Not me, not the rims, it's the tires. Once they were mounted they were not round. These are very poorly made tires. Normally I like Vittoria tires, have had good experience with the Vittoria Randonneurs (non-Cross), but not these. Sorry you had a problem with these. If you bought them from us, we'll be happy to take them back for a refund.